This past weekend, I had a chance to visit with The Picky Eater, Jr. when he came into town for the family’s fantasy football draft. He and his doctor-wife are busy with their lives in Wichita, so I look forward to any opportunity to catch up. He has started a photography blog, The Necessity of Wildness, so we also got to talk shop. When he comes to visit, I like to send him home with treats. Since lemon is his favorite flavor, it also gives me the chance to experiment with lemon-centered recipes. 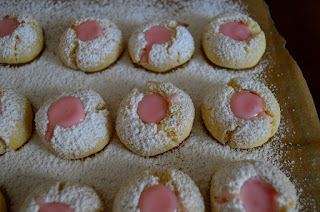 This time I made Pink-Lemonade Thumbprint Cookies from a past issue of Martha Stewart Living. for an additional 16 to 18 minutes. If I did that, I would have had pink-lemonade hockey pucks! It should say 6 to 8 additional minutes, for a total baking time of 16 to 18 minutes. The cookies are tart and tasty. They are also easy to make with few ingredients. Best of all, The Picky Eater, Jr. liked them, as did everyone at the draft gathering. whisk together the flour, 1/2 cup confectioners’ sugar, and salt. Set aside. In the bowl of a stand mixer, beat together the butter and 1/4 cup of confectioners’ sugar, lemon zest, and 2 tablespoons of lemon juice at medium speed until light and fluffy, about 2 to 3 minutes. Turn the mixer speed to low and beat in the flour mixture. Roll the dough into 1-inch balls and place on the baking sheets about 2 inches apart. Put the sheets into the freezer for 10 minutes. Place the sheets into the oven and bake for 10 minutes. Remove and make an indentation in the middle of each cookie with the end of a wooden-spoon handle. Put the sheets back into the oven and bake until the cookie bottoms are golden, about 6 to 8 minutes. Remove the cookies from the sheets to a cooling rack and cool completely. 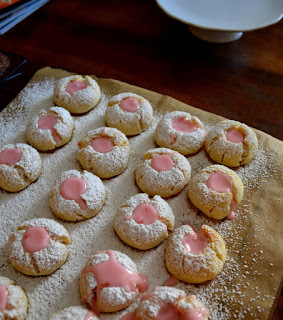 Whisk together the remaining confectioners’ sugar and lemon juice with the raspberry, making sure to break up the berry so the mixture turns pink. Dust the tops of the cookies with confectioners’ sugar, and then spoon the pink filling into the indentations. Let sit for 10 minutes before serving. Store at room temperature in an air tight container for up to a week—if they last that long. 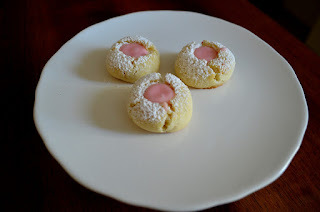 These are a unique and different cookie! Lovely for a summery treat.